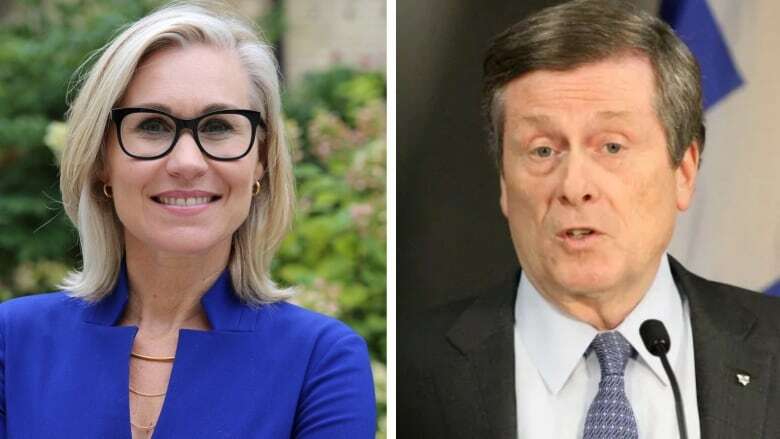 An examination of Jennifer Keesmaat's plan compared to what John Tory has been moving forward over the last four years reveals some stark differences in priorities among the two mayoral candidates. Jennifer Keesmaat has billed her vision for transit as a "real plan" for Toronto. It's also a familiar one. The mayoral candidate — and biggest challenger to the incumbent John Tory — unveiled her city-wide, network-based plan on Thursday. There are a few GO stops, the same ones Tory has branded as SmartTrack stations. There is enhanced bus service on several routes, which aligns with an existing TTC push for more express service. 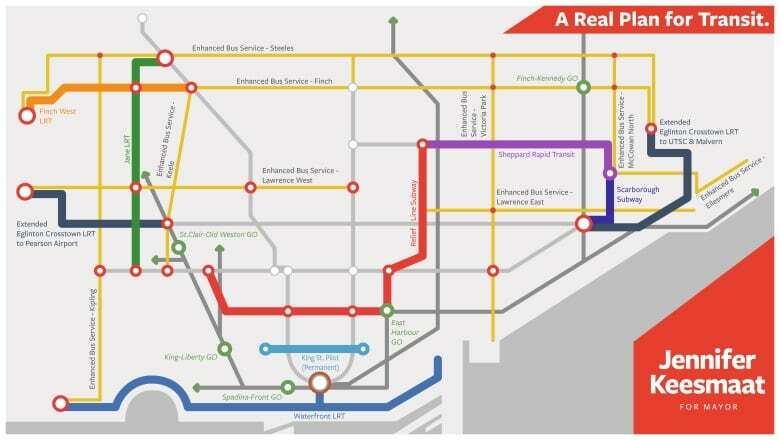 There are multiple light rail routes, including a Jane LRT, Waterfront LRT, and extensions east and west on Eglinton, which all harken back to the decade-old Transit City proposal from the David Miller era. Tory's campaign team put things a different way: Keesmaat's ideas are "nothing new." 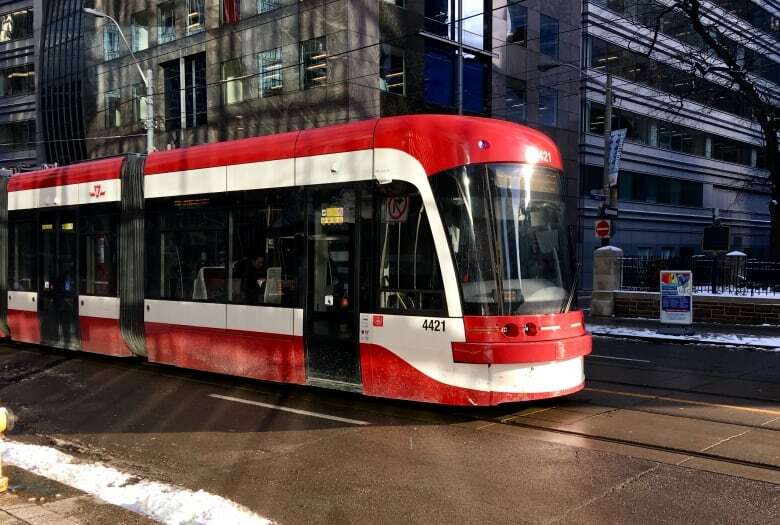 But transit watchers say it's more nuanced than that — and a closer examination of Keesmaat's plan compared to what Tory has been moving forward over the last four years reveals some stark differences in priorities among the two candidates. On Thursday, amid her slate of LRT proposals and enhanced bus routes, Keesmaat outlined her top priority: Building the long-awaited downtown relief line. There's no question both candidates agree on getting a relief line up and running, says longtime Toronto transit advocate Steve Munro. The difference, he adds, is the timeframe. Tory's campaign website declares that city council approved Toronto's Transit Network Plan to 2031, which includes a downtown relief line linking the Pape subway station on Line 2 to the Queen and Osgoode stations on Line 1, with nine stops included. Keesmaat wants to see the line built by 2028, three years sooner than current projections. She also told CBC Toronto that she believes Premier Doug Ford's promise to fund and build a three-stop Scarborough subway, but wants to build LRT in the area as well while scrapping several "redundant" GO stops for Tory's SmartTrack line — a project she's dubbed a "mirage." Her subway stance is a shift back to an earlier concept, and a departure from the controversial one-stop subway extension to Scarborough Town Centre that's backed by Tory amid ongoing opposition from some councillors and transit watchers. "The important thing is, she's saying we really have to stick at looking at a network," says Munro. "It's not enough to say, 'I'll build you SmartTrack' or 'I'll build you the Scarborough subway' and somehow this fixes every problem — because it won't." Cherise Burda, executive director of Ryerson University's City Building Institute, agrees the two candidates are focusing on different issues. Keesmaat isn't adding new line concepts, but is trying to move forward faster with the transit plan she helped develop while being chief planner at the city, Burda says. "The difference is prioritizing projects we need most urgently... so of course, the downtown relief line is something that we need," she adds. Toronto suburbs are also in need of transit network investment, she says, "not just a short subway" in the case of Scarborough. University of Toronto professor Matti Siemiatycki says Tory's transit goals over the past four years have focused on narrowing down what his SmartTrack campaign promise would be in reality, with the concept shifting from 22 stops along existing GO train lines down to six. Still, Tory has been juggling a lot of work "behind the scenes" on lines like the Yonge subway extension to Richmond Hill and the relief line, he adds. Siemiatycki also calls Keesmaat's vision a "bold and ambitious plan for Toronto" with an important focus on planning an integrated network, as opposed to individual lines. Munro says the big question now, for both candidates, is how to fund their ideas long-term. "The big gap in all of Tory's plans is there's no money for all of this because so much is concentrated in paying for the Scarborough subway and for SmartTrack," he says. Currently, the one-stop Scarborough subway is a $3.35 billion project, while city council has committed nearly $1.5 billion for the six SmartTrack stations which will all be operated by Metrolinx, a provincial agency. Keesmaat says it's not possible to fully cost-out her plan at this stage, but estimates it would cost $50 billion over a 30-year span. And she and Tory share one key thing in common: A belief that money will keep rolling in. Tory's team stresses he has attracted $9 billion in funding from other levels of government to pay for projects so far, while Keesmaat says she's confident she'll be able to do the same. But from funding to council support, transit watchers say there are always roadblocks to implementing ideas — be they bold, or familiar. "Every time there's an election, people are drawing lines on a map," Siemiatycki says. "How do you actually get these projects built?"